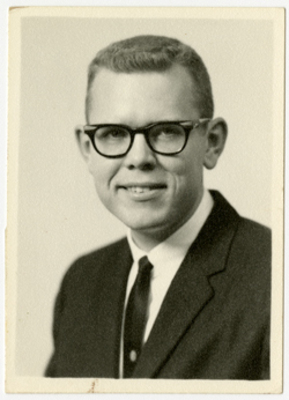 "Portrait of Gary E. Gran"
A portrait photograph of Gary E. Gran, a student of Wesley college. The photograph was sent to Mrs. Julian who was the housemother of Sayre Hall during Gary's time at Wesley College and UND. Information taken from the back of the photograph. Wesley College (later Wesley Center of Religion) was a Methodist institution located at and affiliated with UND. It provided primarily music and religious courses and housing for students enrolled in both institutions.